Finding Joy in Everyday Life by Latressa A Crawford tackles the problems many people face in an extraordinary way with the use of Bible excerpts. Life can be troublesome when you are confronting medical problems, your children appear to stray, your manager has set irrational requests and due dates for you or when your loved one appears to have lost their path. This book gives genuine distinctive tactics into discovering happiness within yourself and others around you. You can use this book on a daily basis to gain inspiration and motivation when life seems to be an uphill struggle. It will arm you with an invaluable toolkit to not only find comfort when life gets difficult, but also to prepare you to face challenges in the future. 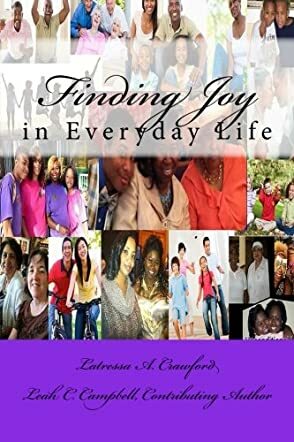 Finding Joy in Everyday Life by Latressa A Crawford is a unique book and a thoroughly good read. It has numerous short stories covering many of life's issues, including relationships, self-worth, financial and emotional difficulties. Using quotations from the Bible, you are asked to analyse the issue and all the negative thoughts associated with it, and then reflect on a solution. The use of prayer to enable a feeling of comfort and a clearer insight is very helpful. To know God has a greater plan for you and will only set you challenges He believes you can overcome is reassuring. You are reminded of the difficult moments in your past and how, with God's support and guidance, you were able to find clarity. A fantastic book and one that I would recommend.